Sky Arts’ search across the UK and Ireland for an inspiring and talented artist to be crowned Sky Arts Portrait Artist of the Year, began on Tuesday 5th November at 8pm on Sky Arts 1 HD. Cass Art is proud to have supported the artists competiting for the title by providing all materials for the competition round in Trafalgar Square, with artist-quality materials from our friends at Winsor & Newton. The competition works with the National Portrait Gallery aims to discover and nurture artists of all capabilities, whether professional or amateur. Hosted by Joan Bakewell and Frank Skinner, the six part series follows the entrants as they compete to be awarded a £10,000 commission to paint Hilary Mantel for The British Library’s permanent collection, and a year's supply of art materials from Cass Art. Under the watchful eye of the judges - Kathleen Soriano, Director of Exhibitions at the Royal Academy, Kate Bryan, Head of Contemporary at the Fine Art Society and portrait artist Tai-Shan Schierenberg - the artists are given their first task of painting a celebrity at national heats held in London’s Trafalgar Square, Dublin and Glasgow. 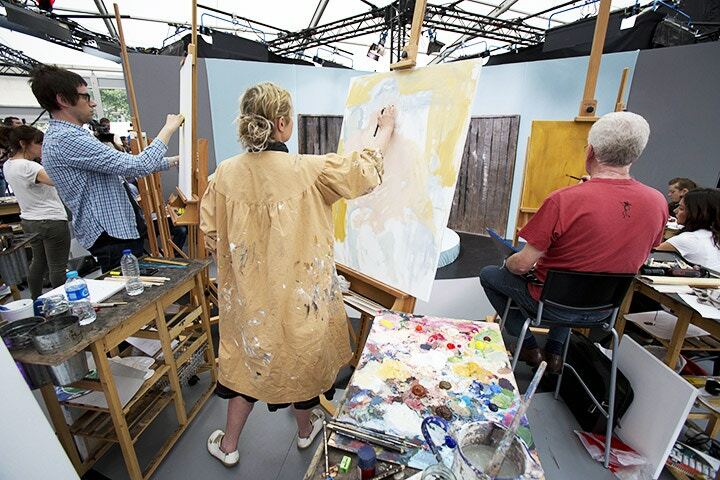 With one national finalist selected at each heat, the four remaining finalists are subsequently sent on further challenges, including painting Sophie Dahl in Paris. Cass Art has interviewed heat winners Luis Morris (London), Nick Lord (Cardiff) and Ewan McClure (Glasgow). You can also shop the products featured in the programme, sponsored by Cass Art. We have also written an introduction to portrait painting in a How To for Sky Arts. In the grand finale, the finalists’ work will be displayed at the National Portrait Gallery and will remain on display for the public to see in December. The overall winner will be chosen by the series’ judges together with Sandy Nairne, the Director of the National Portrait Gallery. Don't miss the final on Tuesday 10th December 2013 at 8pm on Sky Arts 1 HD. For more information about the programme visit the Sky Arts website.